A friend came to me with the following FootChess position, claiming that White had a way of forcing a win. I'll admit that I regarded the board with skepticism, but as time passed it began to seem plausible. How might it have been done? There is a Ball piece that starts in the center grid intersection, it is treated as being in D4,D5,E4,and E5; whichever piece first occupies any of those squares plays the Ball as if it were in the square they occupy. The Ball is played by any piece 'capturing' it. Instead of being captured, the ball immediately moves as a Neutral piece of the same variety that captured it, under the control of the capturer. If the Ball would capture a piece on this move, it is instead treated as if captured by it. This is called a Pass. Check and Checkmate are not relevant. Instead the game ends by moving the ball into the opposing goal; that being either D0, E0 or D9,E9. Pieces may not occupy these Goal Squares. 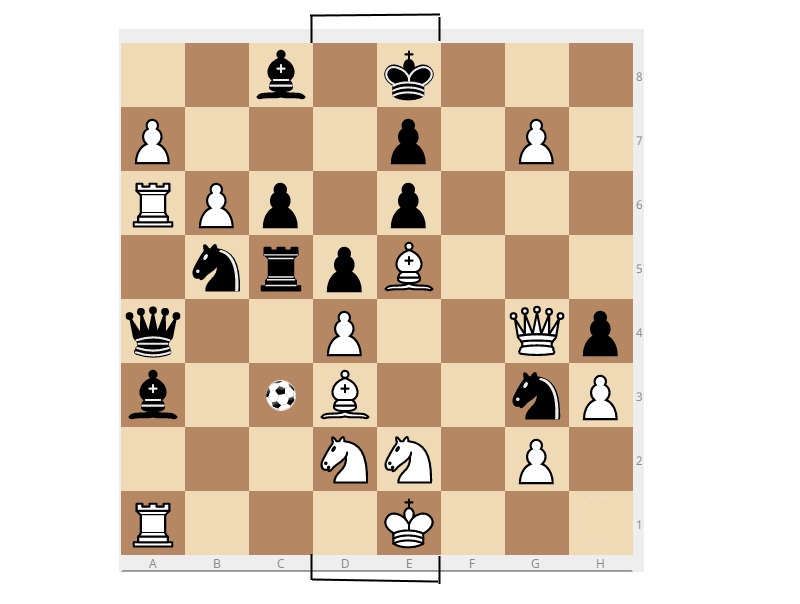 All pieces may capture opposing pieces as Standard Chess, the exception being that a King may not be captured while on his home ranks, those being 1,2 for White, and 7,8 for Black. The Ball may be played by a pawn through either a capture move into its square, or by a standard move into its square. A pawn may play the Ball to a Capture square even if no Capture exists. Or a standard move sqaure even if there is a piece there. This means a pawn may always play the Ball to a square immediately or diagonally in front of itself, as well as two ranks directly in front of itself, if it is passed to while on its home rank. And here is a link to the first Footchess puzzle. Any of those is followed by pawn captures ball, converts to knight, scores. White still threatens to send the ball to f3, then to g8. ... Kf7 (or f8, since check does not matter and the king is invulnerable on ranks 7 and 8). Black isn't threatening anything, and can't reach the ball, so white is free to just mop up black's pieces. The rook and forward bishop are vulnerable White also has pawns ready to promote to queens. If black makes a move to threaten b1, white can easily pass the ball to f3 or any of several other places it would take at least two turns for black to attack. At this point, black is so far behind in material, it's hopeless. Broadly speaking, you've got to get the ball across to the queen, where the black pieces cannot intercept it, get it to the e5 bishop and pass it up to b8, where the a7 pawn can promote to a knight and score. The alternative is to pass it to the g7 pawn and push it forward to g8, then promote to a knight and score. (2) Nxe4 (either N is fine, I think) and pass to g5. There are two threats. Either Qxg5 pass to e5 pass to b8 for the first sequence, or Qxg5 pass to g7 pass to g8. Black has only one move, and cannot stop both threats. Partial Solution, mostly organizing my ideas. Will denote ball as O, pass combinations with dash. We'll almost surely need to use the Pawn at g7 to score, it can score when it promotes to a Knight, and is open to a pass from Bishop and Queen. It will be harder to force a7 pawn to score due to knight at b5. Nc3 Ob1. This seems the safest location and leaves options open. Without interference it lets white Rb1 0e1-f2, followed by Kf2 Og2-h3-g4-g7-g8. With the pawn then scoring by taking g8. The other potential pass path would seem to be Bb1 Og6, and then Qg6 Og7-g8, and score with Pg8(N) Oe9. This is of course incomplete, and I still need to explore black's responses as the king can simply take the pawn in two moves, although that would just allow white's queen to score. Not the answer you're looking for? Browse other questions tagged chess sports or ask your own question.